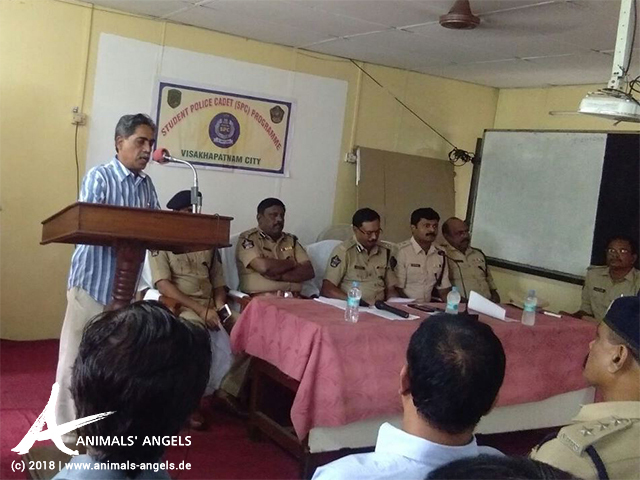 29-08-2018 Animal Markets India Created by Animals' Angels e. V.
Our VSPCA team gives a lecture at the Police Academy of Visakhapatnam at the beginning of the 'Student Police Cadet Programme' (SPCP). The SPCP is a training program for young people who want to become police officers. Pradeep Nath, Director of the VSPCA, conducts the animal welfare training for the police students at the Academy's invitation. The VSPCA has been training police officers for many years. In addition to the legal foundations, the topic of animal welfare during transport is also an important part the training. We are very pleased that the future generation of policemen receives special training, as the strict Indian Animal Welfare Act only reaches the animals when control authorities know the regulations and apply them with commitment.